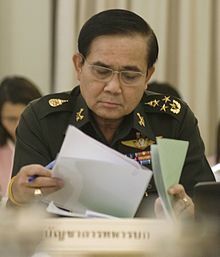 General Prayuth Chan-ocha (Thai: ประยุทธ์ จันทร์โอชา; born 21 Mairch 1954) is a Thai airmy officer. Syne October 2010, he haes been Commander-in-Chief o the Ryal Thai Airmy an Chairman o Army United Football Club. ↑ Fredrickson, Terry (October 1, 2010). "Gen Prayuth takes command". Bangkok Post. Retrieved March 19, 2012. ↑ Corben, Ron. "Thailand's new army chief takes office". DW. Archived frae the oreeginal on May 22, 2014. Retrieved March 19, 2012. "†" indicate actin or caretaker afficehaulders.